Segerstrom Center’s School of Dance & Music for Children with Disabilities is ongoing, with a four-week summer session that takes place July 24 – August 18 and an eight-week series that will begin in the fall from September to November. For more information, please call (714) 556-2122 ext. 4337 or e-mail Community@SCFTA.org. The Center’s School of Dance and Music for Children with Disabilities is offering a summer schedule. Classes are inclusive and designed for children with disabilities such as Down syndrome, cerebral palsy, autism spectrum disorders, audio and visual impairments and other complex needs, but are open to all. Classes help children to explore their full physical and social potential through dance, movement, music and creativity. They will have fun while exercising and improving balance, coordination and confidence through personal and social growth. Four-week tuition is $80. Please visit www.scfta.org/summerdance for more information. 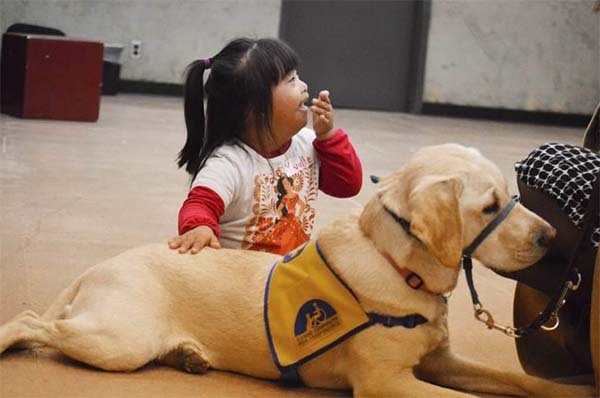 Founded in 1975, Canine Companions for Independence® is a non-profit organization that enhances the lives of people with disabilities by providing highly trained assistance dogs and ongoing support to ensure quality partnerships. The assistance dogs they breed, raise and train aren’t just the ears, hands and legs of their human partners. They’re also goodwill ambassadors and often, their best friends. They open new opportunities and new possibilities, and spread incredible joy. Canine Companions unite people with dogs in a powerful program that leads to greater independence and confidence. For more information, please visit www.cci.org. Segerstrom Center is a leader among the nation’s performing arts centers for providing education programs designed to inspire young people through the arts. The Center’s programs reach hundreds of thousands of students each year in five Southern California counties. Community engagement programs developed through the Center for Dance and Innovation and Center Without Boundaries also connect the Center more comprehensively with Orange County’s many diverse communities. The CDI supports flagship artistic programming and a wide range of projects that celebrate innovation, nurture creativity and engage audiences of the future. It is home to the ABT Gillespie School and the School of Dance and Music for Children with Disabilities. The Center Without Boundaries develops partnerships with non-cultural organizations to help them in their own efforts to respond the ever-changing needs of the community.